Within four weeks after your return, you should submit all required documents. You can also apply for the recognition of foreign academic achievements if the Transcript of Records has already been made available by the partner university. Please send a scan of the listed documents / references via e-mail to your responsible outgoing team. 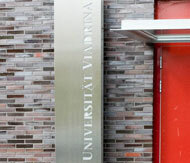 Learning agreement – Signed by the Viadrina, the partner university as well by yourself. Transcript of records – Usually sent to us by the partner university directly by email or regular mail. We will inform you as soon as it has arrived. An online grade overview or forwarding the email from the partneruniversity is not sufficient to recognize your courses. If you, however, received your original paper transcript, you will have to come by and show it to us or send it to us by regular mail. You can have the original transcript back afterwards. OLS-Language Test – A request will be sent to you by email automatically at the end of your stay abroad. You do not need to take the test after the mobility, if you achieved C2 level in the first assessment before your mobility. EU-Online study report – You will receive an email with a link to the questionnaire. Please also check your spam folder. The email might arrive after the four week deadline. If you cannot find the E-mail, please contact your outgoing coordinator. Recognition of study achievements abroad – Depending on the faculty by email or hard copy. Details about the recognition can be found on the website. Please send all documents collected as a scan / photo via e-mail to your responsible outgoing team. In addition, the letter of confirmation and the transcript have to be in the original. Experience report – To be sent to your respective coordinators. Transcript of records of the partner university – Is usually sent directly to us from the partner university. We will inform you of its arrival by email.